One of my goals for autumn of 2014 was to try out a few new recipes. Dishes that I have always been curious to try but the dishes themselves seemed much too complicated or sophisticated for my time and energy level. Well, autumn turned into winter and here we are in the new year! I have yet to try all 5 recipes but one I'm super excited to finally share is the Super Creamy Butternut Squash Risotto. Add chopped bacon into the shallot/onion to give the dish more depth (and frankly, everything ALWAYS tastes better with bacon!). Heat up only enough chicken stock as necessary. 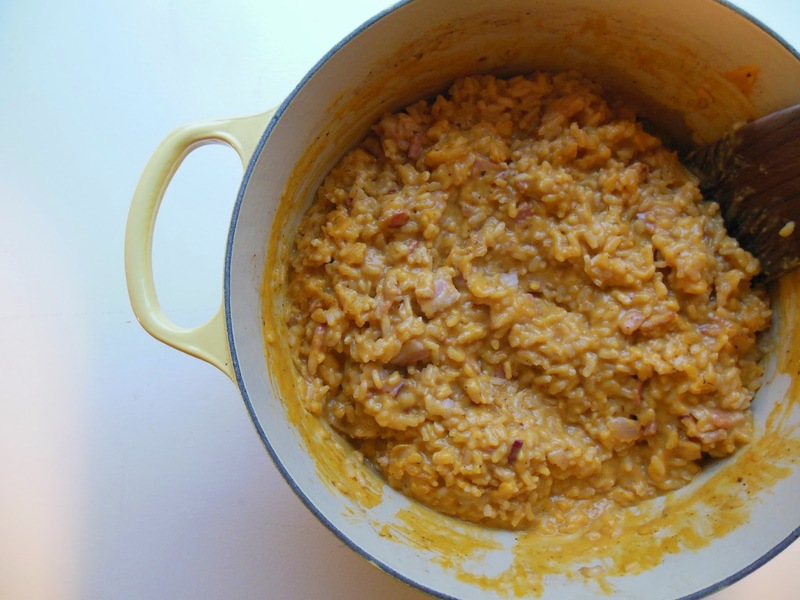 You can always heat more up but the worst case of risotto is if it goes mushy and gloppy a.k.a. too much stock. Add one cup at a time and continuously stir throughout. In total, I used 7 cups stock for 2 cups of rice. Taste the risotto throughout the cooking process to decide when it is done. Unless you LOVE butternut squash, only use half of the squash. I find the flavor is overwhelming and half was plenty. 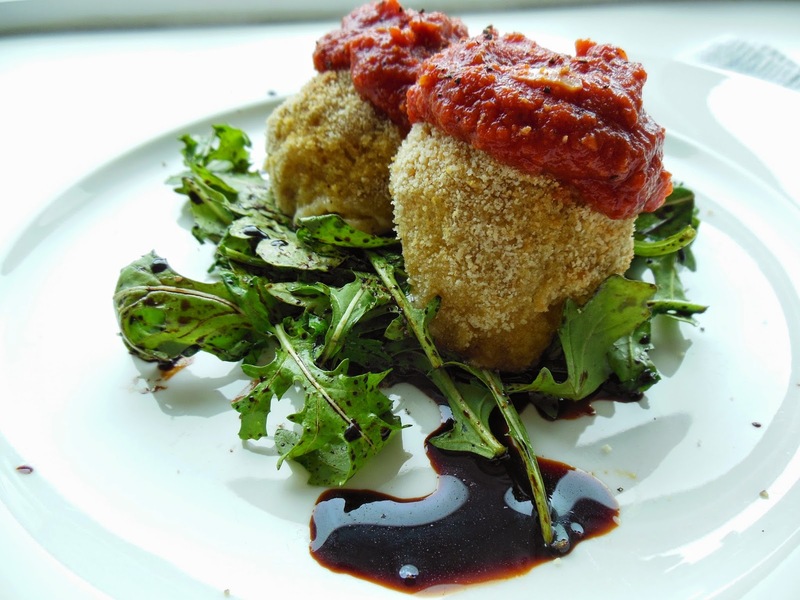 Okay, now let's talk about Arancini. Typically a fried italian dish that involves risotto and cheese. What could be better right? This is a lighter version with the same amount of flavor and crispiness which will have you turning to this dish for a healthier alternative to this oh so delicious appetizer, main or even a midnight snack! Whisk the eggs and milk together, set aside. 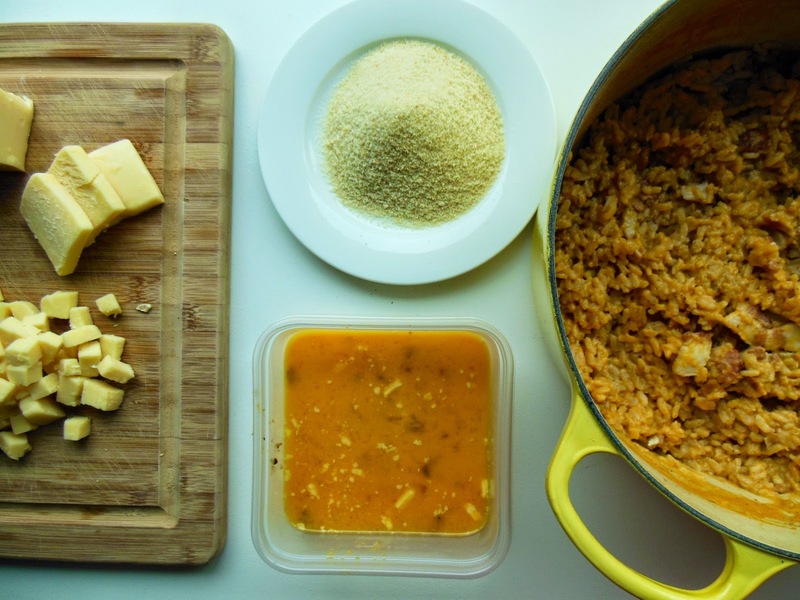 Using a tablespoon, scoop out a half-palm size of risotto, flatten a bit and add enough cheese to fill, cover the cheese completely with the risotto, forming into a ball. Roll the ball in the bread crumbs, then the egg mixture, roll again in the bread crumbs and lay on a cookie sheet. 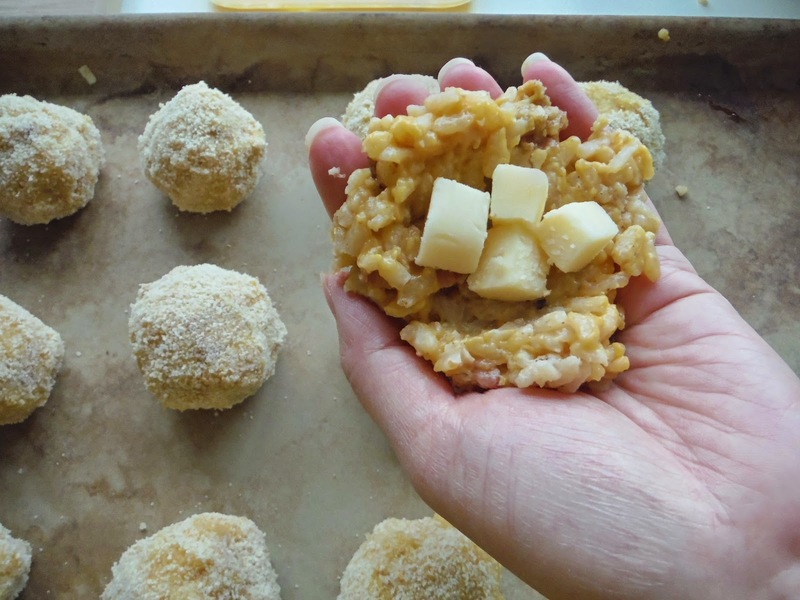 This process gives the baked arancini the necessary crispiness. 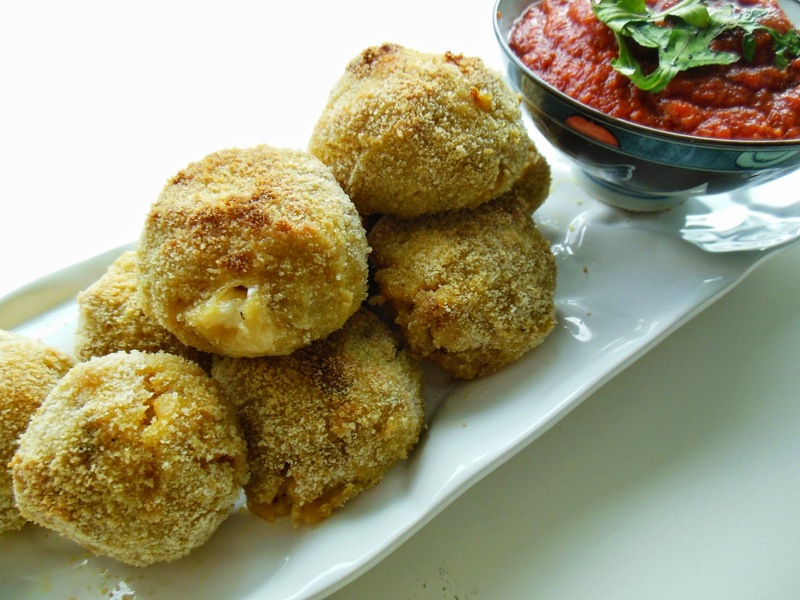 Repeat with all remaining risotto and drizzle olive olive overtop the arancini balls. 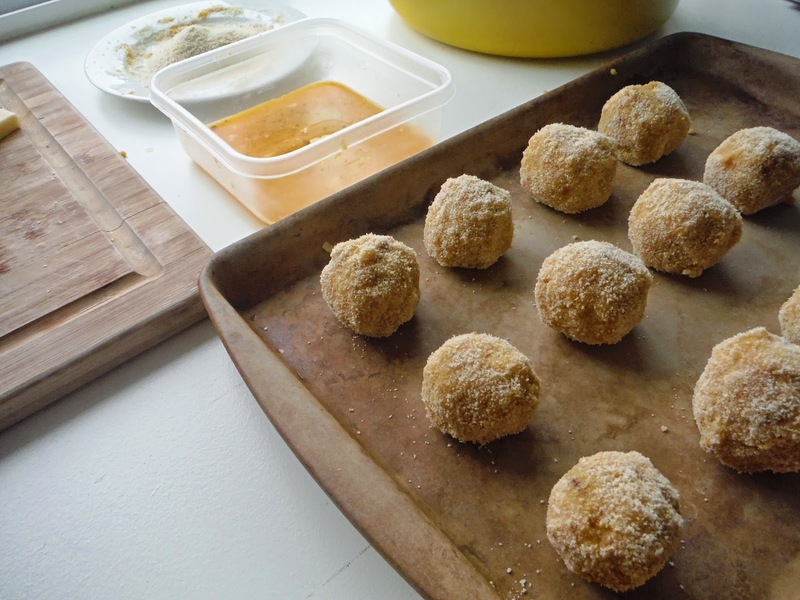 Place prepared arancini balls on middle-rack in heated oven for 15 minutes. At the 15 minute mark, turn on the broil part of your oven. Move the arancini to the top-rack directly under the broil for the remaining 10 minutes until nicely golden and some of the cheese starts to escape and melt. Appetizer/Snack - serve the marinara sauce on the side. Main - place a couple arancini balls on top of some warm greens and reduced balsamic vinegar, top with the marinara sauce and some freshly cracked pepper.